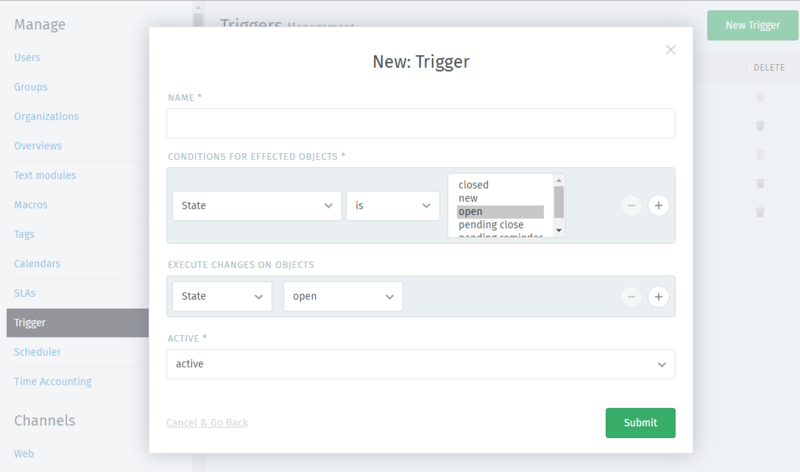 Triggers will be/are executed (ordered by name) on every ticket creation or update. They are executed at the time of changes on tickets or to send notifications. Sending auto replies for new tickets to customers to let them know that a ticket has been created. Setting the ticket owner on the first reply if no owner is set. Based on matching conditions, certain changes on tickets will be made and/or notifications will be sent. Ticket attributes: Define matching ticket attributes for which a trigger will be executed. You can also distinguish between creating and updating tickets (it’s called action). Customer attributes: The customer attributes of the changed ticket must match these selected attributes. Organization attributes: The organization attributes of the changed ticket must match these selected attributes. Defines what to do if conditions are matching. For example, new tickets of an old customer will have always high ticket priority. 1. Go to your AriticDesk Account. 2. Then go to Business Rules, click on Trigger. 4. After performing the above steps, click on “Submit” option.